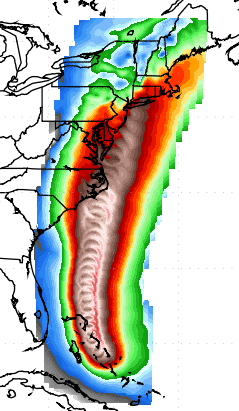 This gives an idea of the wind field around Irene as she moves north. Of course, Irene can shift east or west but we are getting more confident that this will be the approximate path of the storm. This path is capable of bringing tremendous damage to the region along with extensive power outages. 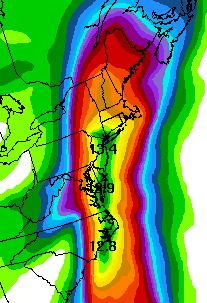 Compounding the problem will be heavy rain (which allows trees to be more easily uprooted) which will cause flooding. This storm will be a big deal. Time to begin taking action is now (see below).